Look East Policy of India was launched by the former Prime Minister P.V. Narasimha Rao in 1991.The main focus of this policy was to shift the country's trading focus from the west and neighbours to the booming S.E. Asian countries. The new NDA government in the centre upgraded this policy as the “Act East Policy” at the East Asia Summit held in Myanmar in November 2014. "Look East Policy" of India was launched by the former Prime Minister P.V Narasimha Rao in 1991.The main focus of this policy was to shift the country's trading focus from the west and neighbours to the booming South East Asian countries. This policy continues till the formation of NDA government in 2014. Since the formation of the new government in the centre, the government upgraded to “Act East Policy”. 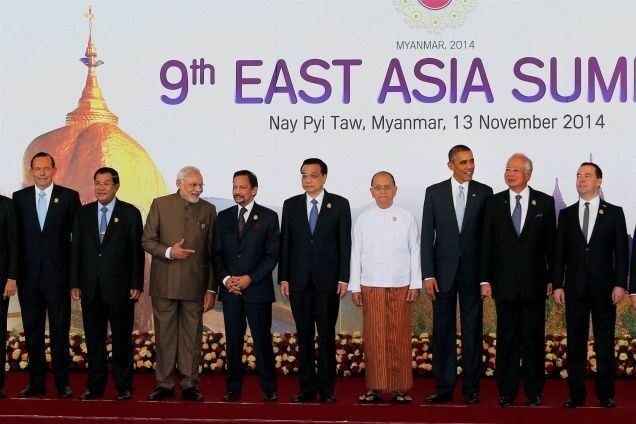 The “Act East Policy” was launched at the East Asia Summit in Myanmar in November 2014. The focus of the “Look East Policy” was to increase economic integration with the South East Asian countries and the area was just confined to South East Asia only. On the other hand the focus of the “Act East Policy” is economic and security integration and focussed area increased to South East Asia plus East Asia. 1. Promote economic cooperation, cultural ties and develop strategic relationship with countries in the Asia-Pacific region through continuous engagement at regional, bilateral and multilateral levels. 2. To increase the interaction of the North-Eastern Indian states with other neighbouring countries. 3. To find out the alternatives of the traditional business partners like; more focus on the Pacific countries in addition to the South East Asian countries. Is India in the position to boycott Chinese products? 4. To curb the increasing impact of China in the ASEAN region. Two-way trade between India and ASEAN moved up to $71.6 billion in 2016-17 from $2 billion in the early ’90s. In contrast, two-way trade between China and ASEAN stood at $452.31 billion in 2016. 5. Experts say that under the “Act East Policy” the government is relying on the 3 C's (Culture, Connectivity and Commerce) to develop better relations with ASEAN nations. In order to ensure the success of the policy, NDA government is putting steady efforts to develop and strengthen connectivity of Northeast Indian states with the ASEAN region through people-to-people contacts, trade, culture and physical infrastructure (airport, road, power, telecommunication etc.). Some of the major projects include Kaladan Multi-Modal Transit Transport Project, the India-Myanmar-Thailand Trilateral Highway Project, Border Haats and Rhi-Tiddim Road Project, etc. India-Japan relations are passing through a good phase from last some years and its proof is that Japan is helping India in many infrastructure projects. These projects are like Delhi Metro Corporation and the upcoming Ahmedabad -Mumbai bullet train project. Indian export to Japan was around Rs. 21.36 billion per month in 2017. However, India’s merchandise exports started contracting in four out of five years between 2012-13 and 2016-17. 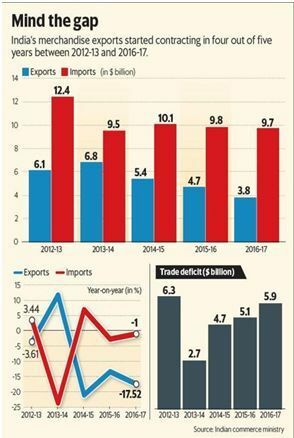 As a result, India’s trade deficit with Japan has now widened to $5.9 billion against $2.7 billion in 2013-14. In 2016-17, India’s exports to Japan contracted 17.5%, and its imports fell by 1%. Indian exports to Japan have almost halved to $3.85 billion in 2016-17, from $6.81 billion in 2013-14. The ASEAN-India Plan of Action for the period 2016-20 has been adopted in August 2015 which identifies concrete initiatives and areas of cooperation along the three pillars of political-security, economic and socio-cultural. India and ASEAN have very good bilateral trade of US$76.52 billion USD in 2014-15 and US$ 71.6 in 2016-17. 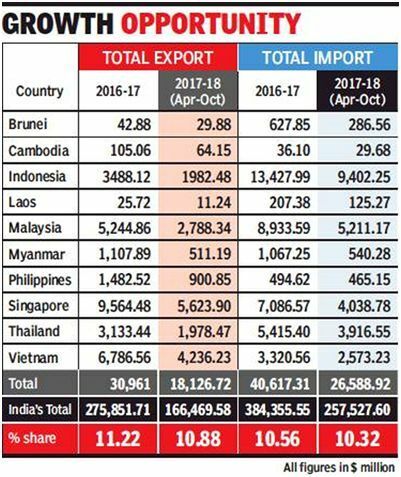 The share of bilateral trade with ASEAN is almost 10% of India’s total trade. ASEAN is a very strong economic bloc which has combined population of 644 million, combined GDP of $2.7 trillion and Per Capita Income $4,200. If you combine India and ASEAN, they have a $5 trillion economy, third largest in the world after the China and USA. In order to harness the benefits of the “Act East Policy”, India has upgraded its relations to strategic partnership with JAPAN, Australia, Vietnam, Indonesia, Malaysia, Singapore and Association of Southeast Asian Nations (ASEAN),Republic of Korea (ROK) and forged close ties with all countries in the Asia-Pacific region. Further, apart from ASEAN, ASEAN Regional Forum (ARF) and East Asia Summit (EAS), India has also been actively engaged in regional forum such as Indian Ocean Rim Association (IORA), Bay of Bengal Initiative for Multi-Sectoral Technical and Economic Cooperation (BIMSTEC), Asia Cooperation Dialogue (ACD) and Mekong Ganga Cooperation (MGC). So in the concluding remarks i would say that the “Act East Policy” is a step ahead of “Look East Policy” of India. If everything goes as per the planning of the government then the objectives of the “Act East Policy” will give desired results very soon. Previous Story GK Questions and Answers on Thalassemia disease?